The publication's weekend print edition comes with a variety of supplements that have, up until now, been contained in a polythene wrapping to ensure they reach their audience intact. Readers of last weekend's edition will have noticed a difference, however, as the newspaper and its additional inserts were packaged inside a silky translucent, biodegradable material made from potato starch. According to The Guardian, the choice to scrap the plastic packaging will make it the first national newspaper to switch to biodegradable wrapping. According to the BBC, some other publications have already moved to potato starch packaging, including the National Trust members' magazine and the New Internationalist. The Financial Times meanwhile doesn't use any plastic packaging for home deliveries of its papers, or in newsagents. The change is part of the newspaper's plan to reduce its reliance on plastic, following feedback from readers, but it will increase the paper's production costs. The price of print editions of The Guardian and The Observer – The Guardian's sister paper, published on Sundays – will in turn go up for the first time in three years. While readers in London, Kent, Essex, Hertfordshire, Norfolk and Suffolk have already received the new packaging from the weekend commencing 12 January, the change will be gradually implemented across the rest of the country over the next few months. 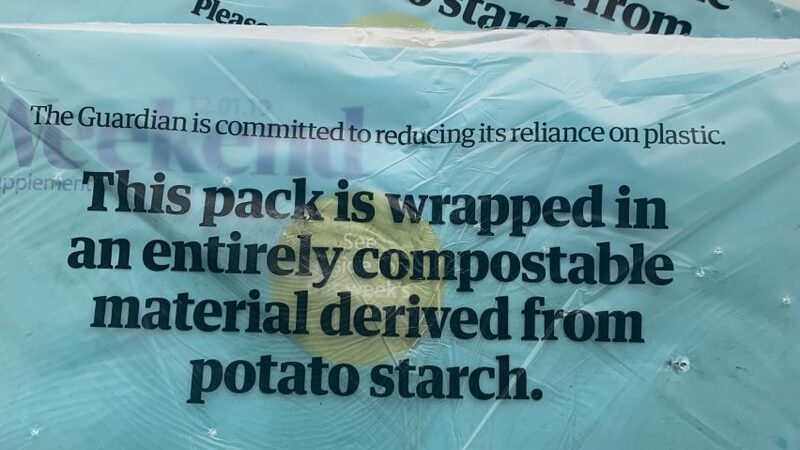 Those in Greater London who use The Guardian's home delivery service will also receive the weekday print edition wrapped in the new potato starch packaging instead of plastic. Designers are experimenting more and more with naturally-derived substances in a bid to offer environmentally friendly alternatives to harmful materials like plastic. Italian designers Simone Caronni, Paolo Stefano Gentile and Pietro Gaeli also used recycled potato skins to create an ecological packaging for fries as an alternative to paper, while Emma Sicher combined food waste with bacteria and yeasts to create disposable packaging as an alternative to plastic.